Colin Coates writes: In March 2015 I met up with Dave Sharp, who had travelled from his home in Flamborough to meet up with friends in Shipley and to have a chat with me about his family who had lived in Saltaire for over sixty years. Dave is a Shipley lad who recalled conversations with his grandfather, William, who was born in Saltaire in 1915. Benjamin Sharp was born in Bingley around 1803. Benjamin married Esther Mitchell (born c1804 in Bradford) 25 January 1829 at St John the Baptist Church in Halifax. They had nine children; Elizabeth, Simeon, Edwin, William, Lydia, Fergus, Paulina, Amelia and Mary Jane. With Benjamin working as a wool comber the family were living in Bingley in 1841 and 1851. By 1861 they had moved to 3 Mary Street in Saltaire. They may have been the first family to live in the house as the street was built about 156. In 1871, with Benjamin having died, widowed Esther was living in Mary Street. By 1881 she had moved to 12 Albert Terrace in Saltaire. William Sharp, the fourth of their nine children, was born around 1836 in Bingley. William married Ann Walker (born c1836 in Keighley) 23 December 1856 at All Saints Church in Bingley. They had two children; Mary Ann, born c1857 in Bingley and Benjamin born 13 August 1858 in Bingley. In 1861 the family lived at 5a Caroline Street in Saltaire with William working as a stoker. By 1871 they had moved to 26 Helen Street in Saltaire with William working as a cloth puller. William died in Saltaire in 1892 and Ann died in 1902. Mary Jane (b1880), Ernest (1882 – 23 March 1902), Lily (b1884), William (1885 – 28 January 1917), Beatrice Annie (b1887), James Harry (25 June 1891 – 11 April 1917), Arthur (25 July 1893 – 1946) and Walter Edwin (1 December 1896 – 1970). Benjamin worked as a joiner (probably in Saltaire Mills) until his death 3 April 1910. James Harry was at his fathers’ side when he died. Widowed Mary Ann continued to live at Higher School Street until she married Arthur Collins 23 January 1915 at St Peters Church in Shipley. They lived at 12 Regent Street in Shipley until their deaths in 1929. In 1911 James Harry was living with his widowed mother and working as an apprentice twisting overlooker, probably in Saltaire Mills. His mother could not read or write and the 1911 census form was filled in by James Harry. 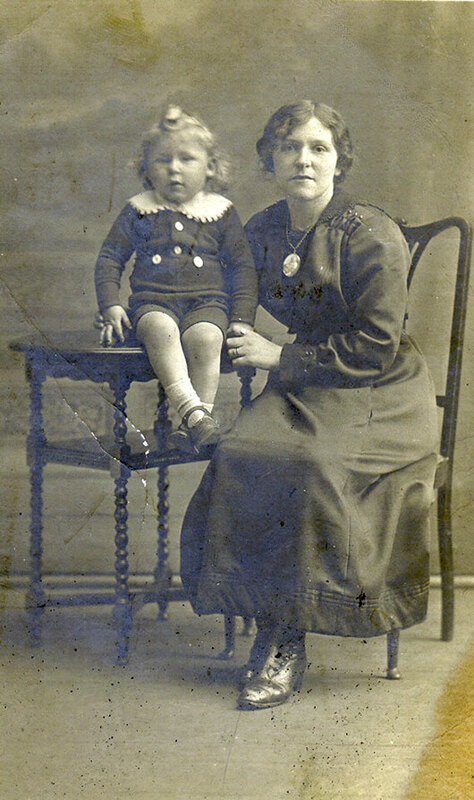 James Harry married Ethel Hartley (b 28 June 1891 in Shipley) 13 May 1914 at St Pauls Church in Shipley. They had a son, William, born 25 September 1915. They lived at 2 Higher School Street in Saltaire. In 1916 James Harry took part in amateur dramatics in Shipley. Following the death of James, Ethel lived in at 2 Higher School Street with her brothers, James & Halliday Hartley. Widowed Ethel married Stanley Holmes (date of marriage not known). Stanley was from Blackpool but met Ethel whilst he was living in Saltaire. He often took Ethel dancing in the ballroom at Blackpool Tower. From around 1919 they lived at 1 Victoria Road in Saltaire where Ethel ran a sweet and herbalist shop with her mother, Harriet. Following the death of her husband, John, in 1897 Harriet married Edwin Pickles 26 June 1898. Edwin died in 1912. Harriet died 18 March 1924 at 1 Victoria Road. In her will she left £221 (worth £12k in 2015) to Ethel. Stanley, Ethel and William, aged just 9, left London for Sydney, Australia aboard SS Borda 23 July 1925. William recalls being bullied at school in Australia. They lived in Australia for just a year, arriving back in London aboard SS Orsova 10 July 1926. By 1929 Stanley, Ethel and William had returned to 1 Victoria Road. They remained there until about 1936. In the 1930’s William lived above a fish & chip shop at Fox’s Corner in Shipley. They had two sons; Michael Barry (b 21 January 1939 at Four Gables Maternity Home in Horsforth) and David Christopher (b 2 August 1946). 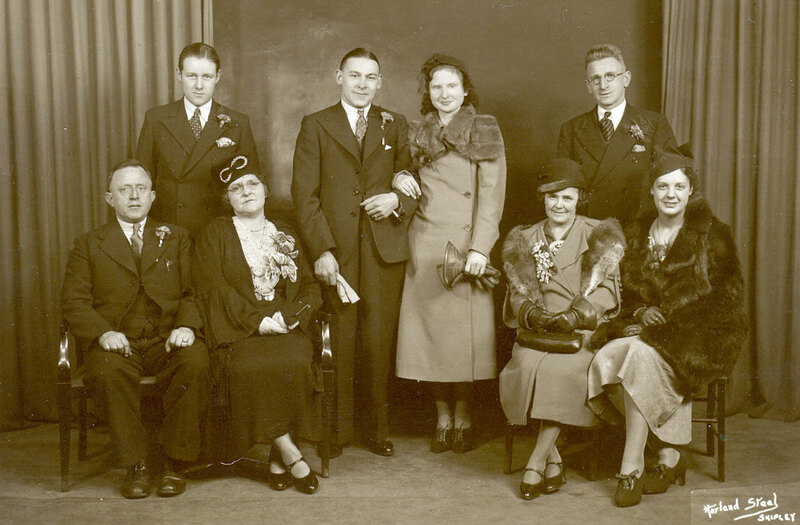 The two families were already linked when in 1925 widower Shepherd Hainsworth (father of Irene, who fought in the war with the Bradford Pals) married widower Beatrice Annie Willmer (aunt of William). It was Beatrice’s third marriage, she had married Tom Sanderson in 1907 and Basil Willmer in 1919. William and his family lived in a new house built by Ogden’s builders at 55 Glenside Road in Windhill. His mother Ethel, having split from her husband, sold her bungalow at 66 Otley Road in Shipley and used the money to buy a shop for William & Irene at 81 New Road Side in Horsforth. They all lived above the shop as Ethel and Irene built a business selling tobacco and sweets. William wanted to be a Spitfire pilot in World War Two, but poor eyesight prevented this. So, against his mother’s wishes he served in the RAF on the ground as a transport crewman. His unit was based in Lancashire before moving to India. In 1944 they fought against the Japanese at the Battle of Imphal. William remembered losing his best mate, when his lorry was blown up in front of him. After the war William was a partner in an ice cream business; one of their wholesale customers was the Shipley Glen Pleasure Ground. They ran the business from a Jowett Bradford van. In 1948 after losing his business partner, William struggled to keep up the payments on the business, so he took on an evening job, sweeping up in a factory in Rodley. This did not prevent him having an adventurous holiday with his wife when they went to Cannes in the south of France by train. William’s mother Ethel died 15 May 1959 at Otley General Hospital. She had been living at 15 Summersgill Square in Horsforth. In her will she left £1589 17s 9d (worth £33k in 2015) to William. In 1967 William and Irene, whilst still running the shop, bought a bungalow to live in at 5 Victoria Walk in Horsforth. They retired in 1980, and sold the shop in 1981. In 1987 they moved back to Shipley to live at 6 Brookfield Road. William died, aged 86, 8 May 2002. Just before he died he had moved into an old folk’s home at Thornbury Barracks roundabout. William had led a full life, outside of his jobs he was a scout leader (9th Airedale in Horsforth) and he was also a freemason. Irene died 25 March 2009, just short of her 90th birthday. WW1, The Saltaire Story, is published on this website.